This new and ingenious crayfish trap will keep you in crayfish for years to come. Here is a recent picture of some of the Trapper Arne inventory. On the top shelf you see some of the JUMBO traps as well as, to the right, some of the traps Trapper Arne uses when he goes crayfish trapping. Some of those traps are many years old, yet they are still going strong. 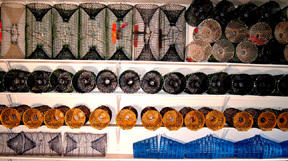 Below the top row you see a row of Trapper traps and below them, on the third row from the top, are some of the TRAPPY crayfish traps with their yellow funnels. As you may notice, the TRAPPY diameter is a trifle smaller than the TRAPPER and the JACKPOT traps while its length is slightly longer. Yet, it seems, it catches just as many crayfish. On the lowest inventory shelf you'll notice some of the JACKPOTS, discontinued BLUEBOYS and a few DIPPER traps. All of these traps are waiting for the next customer. The TRAPPY crayfish trap is made from polypropylene plastic, specially blended to be kind to the environment yet sturdy enough to hold a bunch of crayfish. 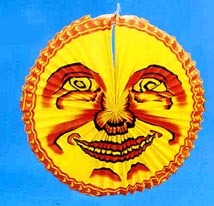 Its colors are cadmium free and the plastic can be recycled or destroyd without damage to the ecology. 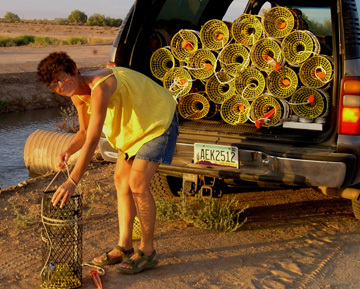 The TRAPPY crayfish trap is a marvel of ingenuity. It is so cleverly designed that it has become known for how fast you can bait, rebait and empty the trap. A bait box is included, if that's your preference, but you can also attach free hanging bait for added crayfish attraction. The TRAPPY has an effective escape stopper, so you can safely leave your traps in the lake for overnight sessions. The Trappy is also collapsible in an ingenious way. The entry funnels are easily snapped off and the rest of the trap lain flat for ease of transport. But best of all, The TRAPPY catches the crayfish. Measurements: length: 520mm (19.5") - diam: 210mm (8.5")- weight: 0.56kgs (22 oz.) - Mesh size: 20 mm (3/4")- trap entrance 2". Here is a another picture of the TRAPPY. In order to both strengthen the trap and add weight, a metal bar is attached along the bottom. This will make the trap sink faster when placed in water. 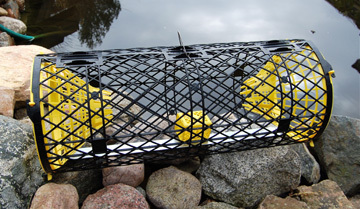 The Trappy seems to be popular in research and academic circles in Scandinavia as well as the UK and is reported efffective in crayfish research in Turkey as well. Several biological and ecological groups in the UK are using the Trappy in their efforts to learn how to protect their native white clawed crayfish. 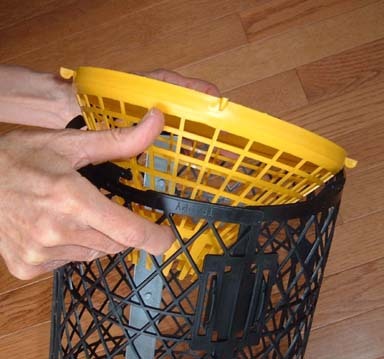 The two yellow funnels can quickly be removed to empty the trap or to add some bait. For this reason, the Trappy doesn't need any 'side door' like the Trapper and Jumbo. You can either use a bait container or hang some bait on a string inside the trap. A research organization in the UK reports that the Trappy actually catches crayfish without bait. Apparently some crayfish are always on the lookout for a hideaway, and seeing the trap, they believe here is a nice refuge. And they walk in! But if you rely on this crayfish habit, you had better lift the trap quite often, as they will soon try to walk out again. And as you know, if there is no bait in a trap, a crayfish will sooner or later find the opening and head for the outside. To twist off one of the funnels of the trap, push in opposite directions on two of the protruding yellow tabs. The funnel will pop off and open the inside to empty the trap of its catch or to bait or rebait the trap. 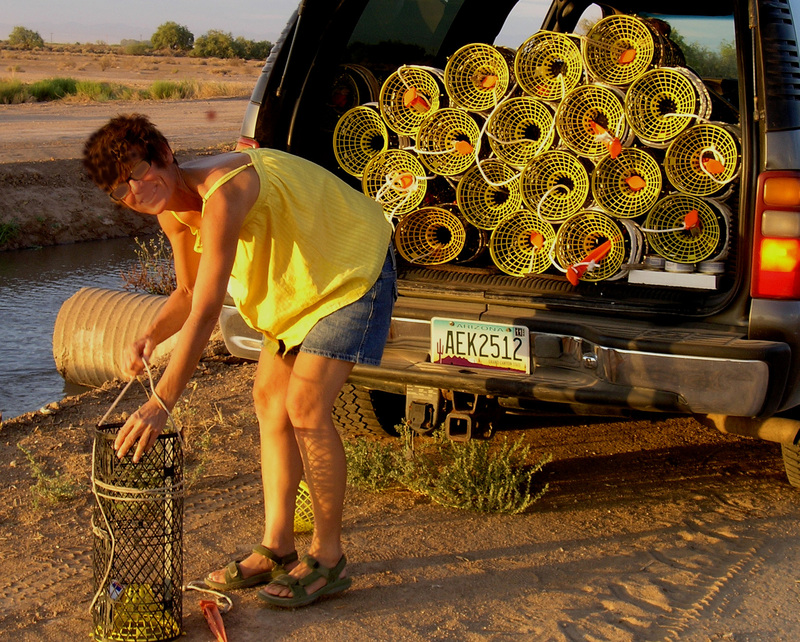 Some Arizona irrigation canals also contain crayfish. When Trapper Arne started in crayfish in Arizona, the canals were his first source of caught crayfish. Then he used one trap at a time. Here a serious crayfish catcher uses a whole truck load of Trappys to really haul in a load of these canal dwellers. Watch the TRAPPY assembly movie here - in Swedish - I'm afraid. But interesting still. 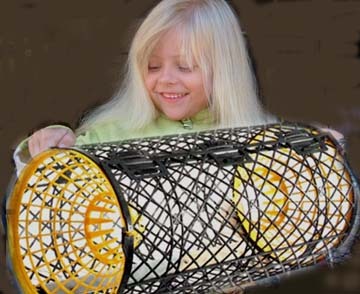 to buy the TRAPPY Crayfish Trap?